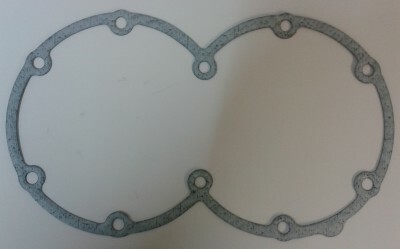 Right Crank Cover Gasket for Thunderbird 900 Range. 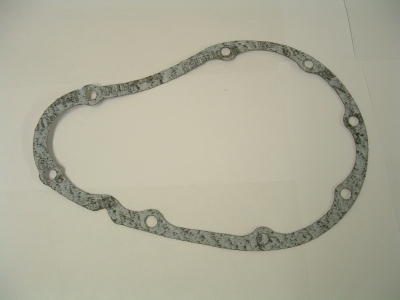 Right crank cover gasket. The Thunderbird 900, Thunderbird Sport, Legend and Adventurer share the same basic engine and all have a one piece right crank and balancer shaft cover. Under this lives the dreaded crank trigger (ignition pick up coil). All good owners of early models have changed at least one of these ! 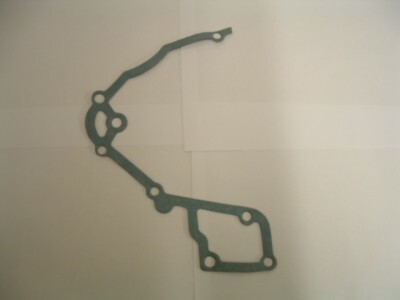 Right crank cover gasket fits all 3 and 4 cylinder carburettor models, except Thunderbird range (see ID 808). The crank trigger (ignition pick up) coil is located under this cover. 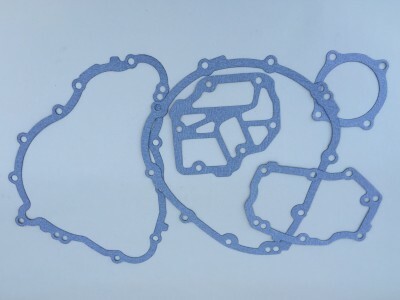 Clutch cover gasket to fit all 3 and 4 cylinder carburettor models. 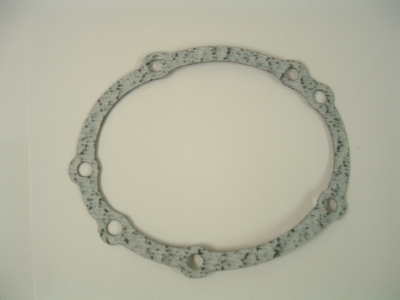 Sprocket cover gasket for 3 and 4 cylinder carburettor models with the sprocket cover which has no oil filler. This fits all the Thunderbird 900 range and later 1200 Trophy models with an oil sight glass in the crankcase. 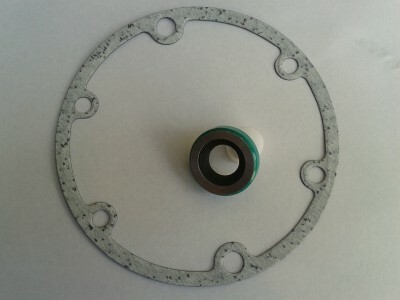 Sprocket cover gasket for all early 3 and 4 cylinder carburettor models with oil filler sprocket cover. 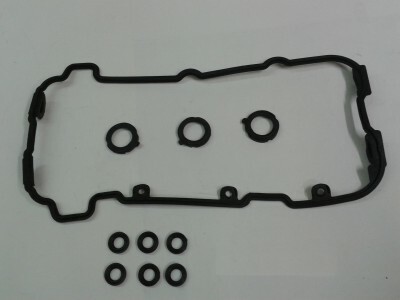 Left side crank cover gasket to fit 4 cylinder 1000/1200 Daytona and 1200 Trophy models. 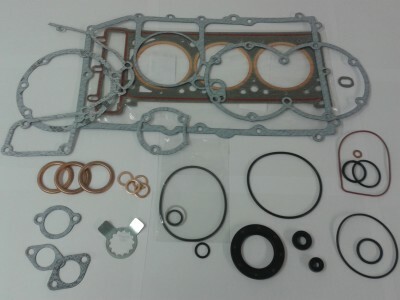 Rotary breather seal and left side crank cover gasket to fit 4 cylinder 1000/1200 Daytona and 1200 Trophy models. 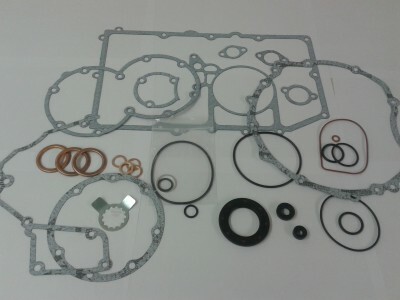 8 piece gasket set to fit Thunderbird 900, Legend, Adventurer and Thunderbird Sport. 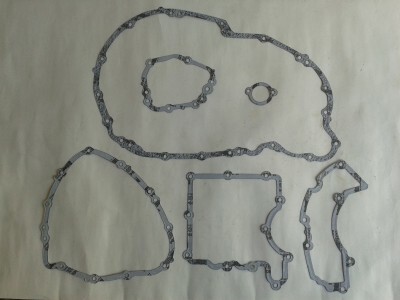 Clutch cover, sump, sprocket cover, right side crank cover, left side crank cover, water inlet pipe, water outlet pipe and cam chain tensioner gaskets. 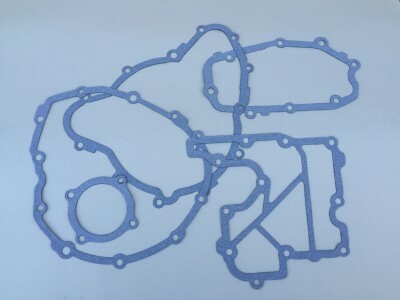 Gasket and seal set to fit Thunderbird 900, Thunderbird Sport, Legend and Adventurer. 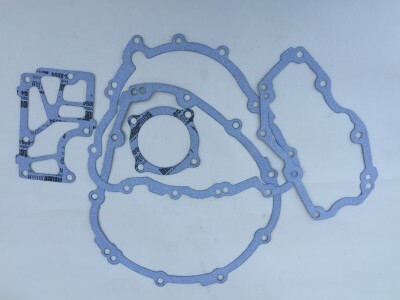 Gaskets - clutch cover, sump, sprocket cover, right side crank cover, balancer cover, left side crank cover, water inlet pipe, water outlet pipe and cam chain tensioner gaskets. 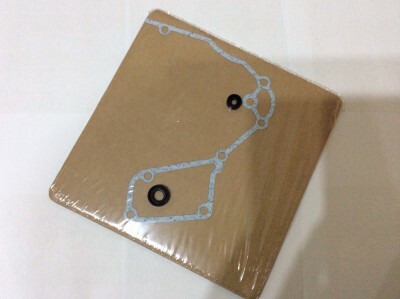 Cover and Head Gasket Set Thunderbird 900, Legend and Sport. 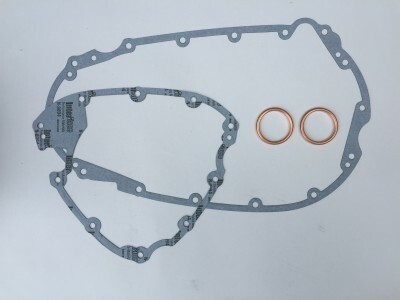 Gasket (including genuine Triumph head gasket) and seal set to fit Thunderbird 900, Thunderbird Sport, Legend and Adventurer. 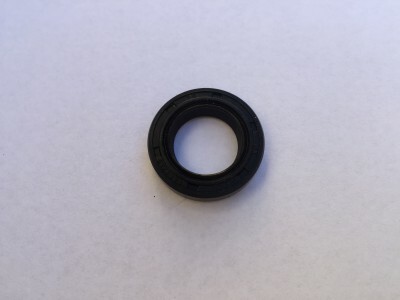 Kit now includes cam cover seal set (not shown in picture), but does not contain valve stem seals. 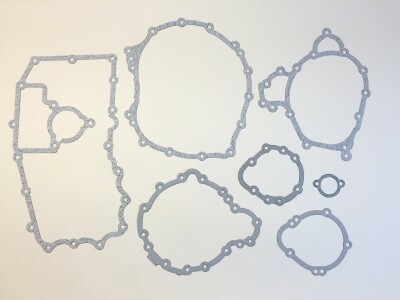 9 piece gasket set to fit Speed Triple 750/900, Trophy 900, Trident 750/900, Sprint 900, Sprint Sport, Sprint Executive, Tiger 900 (carburettor model) and Daytona 900. 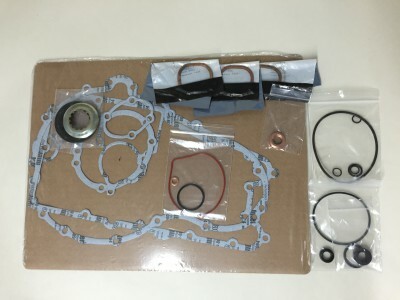 Clutch cover, sump, sprocket cover, right side crank cover, balancer cover, left side crank cover, water inlet pipe, water outlet pipe and cam chain tensioner gaskets. 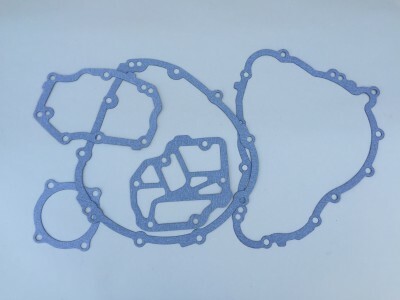 Gasket and seal set to fit Speed Triple 750/900, Trophy 900, Trident 750/900, Sprint 900, Sprint Sport, Sprint Executive, Tiger 900 (carburettor model) and Daytona 900. 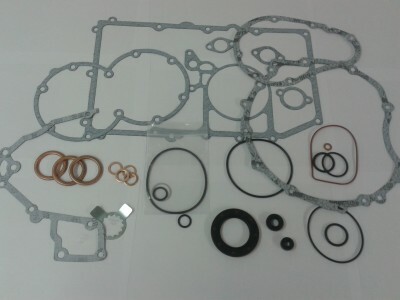 Seals - Clutch pushrod, gearshaft, oil pump feed, sump, output shaft, oil filter x 2, alternator, starter motor, water pump, sump external oil pipe washers, sump plug washers and exhaust seals. 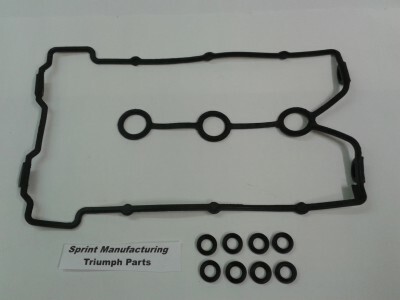 Gasket (including genuine Triumph head gasket) and seal set to fit Speed Triple 750/900, Trophy 900, Trident 750/900, Sprint 900, Sprint Sport, Sprint Executive, Tiger 900 (carburettor model) and Daytona 900. 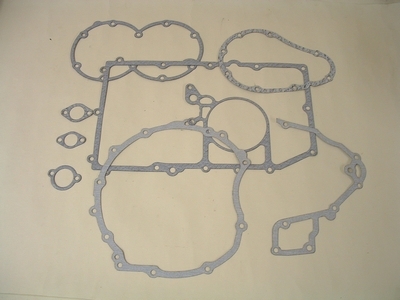 Left side crank cover gasket fits the first generation 955 engine (generator behind the engine block type) and also the 900 fuel injected Tiger. 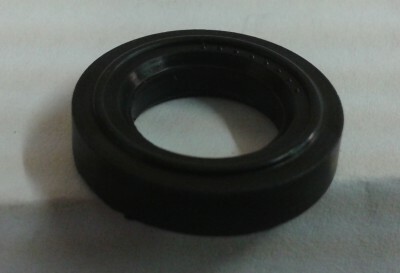 This cover holds the breather seal which often needs changing when the engine has sudden high oil consumption. Kit to stop oil leak. Normally just the clutch pushrod seal is leaking, but a new gasket is required to do the job and changing the gear shaft seal while the sprocket cover is off is a good idea. 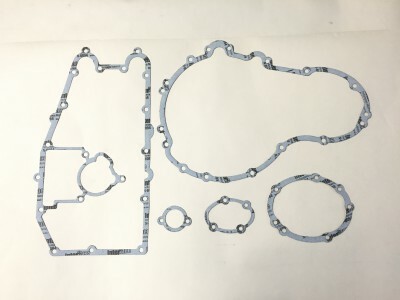 Sprocket cover gasket, clutch push rod seal and gear shaft oil seal to fit 750/900 Trident, Trident Sprint, Sprint 900, Sprint Executive, Sprint Sport, Tiger 900 (carburettor), Trophy 900, Trophy 1200 (all silver and grey engine), Speed Triple 750/900, Daytona 900/1200. 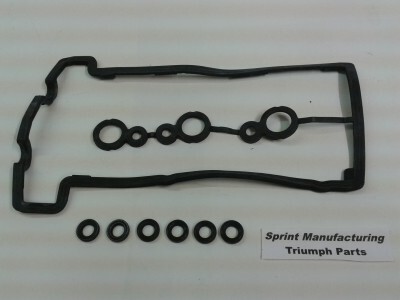 Left side crank cover gasket to fit Trident 750/900, Daytona 750/900, Trophy 900, Tiger 900 (carburettor), Speed Triple 750/900, Thunderbird 900, Thunderbird Sport, Adventurer, Legend, Trident Sprint, Sprint 900, Sprint Sport, Sprint Sport and Sprint Executive. 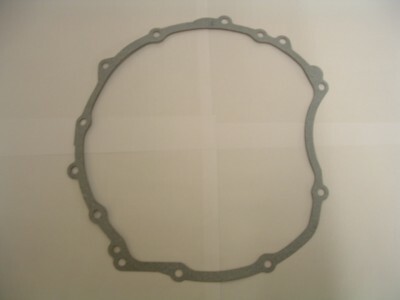 Rotary breather seal and cover gasket for Thunderbird 900, Thunderbird Sport, Legend and Adventurer. 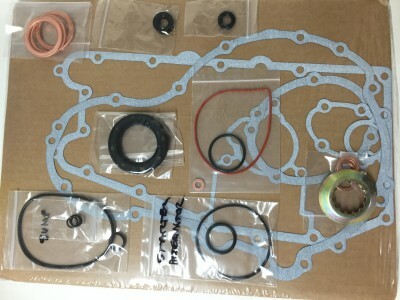 Rotary Breather Seal and Gasket to fit 955 Sprint ST and Sprint RS up to VIN 139276, Daytona 955 up to VIN 132512, 955 Speed Triple up to VIN 141871, Tiger 900i (EFI), Daytona T595 and T509. 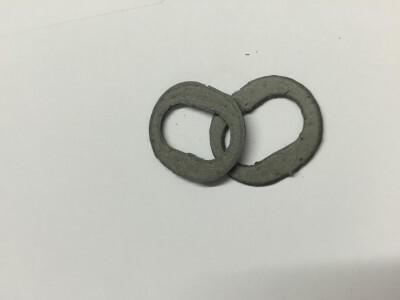 x 2 spacer gaskets used when renewing cylinder head gasket - enough for a 3 cylinder engine and if carefully cut in half to give a horse shoe shape enough for a 4 cylinder engine as well. These are fitted on the exhaust side of the cylinder head between the cylinders. 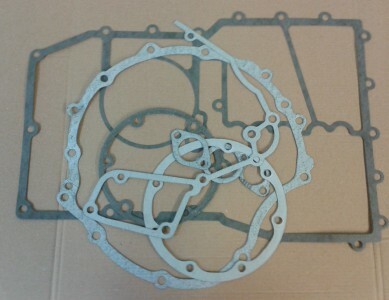 Engine lower outer cover gasket set to fit all 1200 Daytona. This also fits all grey 1200 Trophy engines. The right side small starter clutch cover changed from from VIN 491324 all 1050 models. 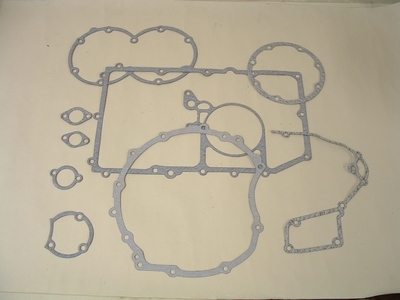 This gasket is also included in every set. 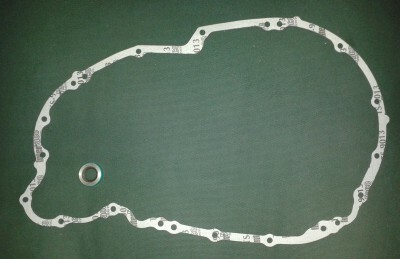 675 Street Triple and 675 Daytona lower engine cover gasket set. Fits: Daytona 675 for years 2006-12 (up to VIN 564947) and all 675 Street Triples. 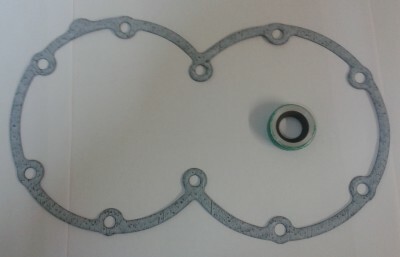 Right side crank cover (timing cover) gasket to fit all the Bonneville range. The alternator and crank sensor are under this cover. Fits: Bonneville 800/865, T100, Scrambler, Thruxton, Speedmaster and America. 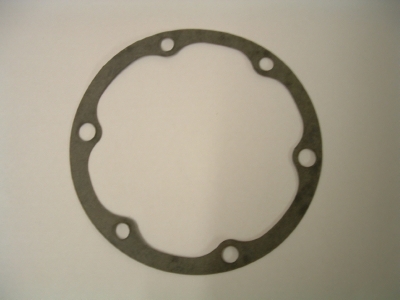 Rotary Breather Seal and Gasket to fit carburettor Bonneville, T100, Speedmaster, Thruxton and America. 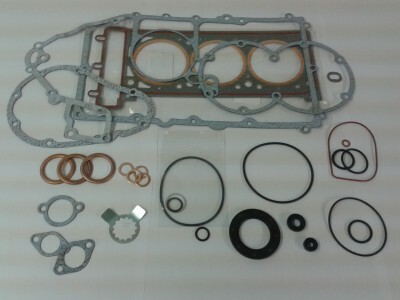 Bonneville cover gasket set. Clutch cover, sump, right engine cover, cam chain tensioner, gear change cover and breather plate cover gaskets. Fits Bonneville carburettor and EFI all models. T100, America, Speedmaster, Thruxton and Scrambler. 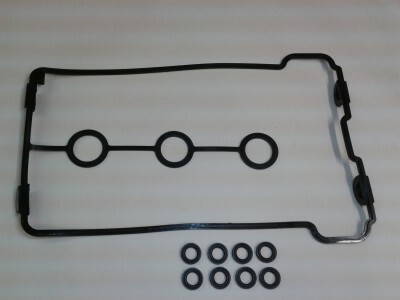 Cam cover and cam cover screw seal set for all carburettor 3 cylinder models. 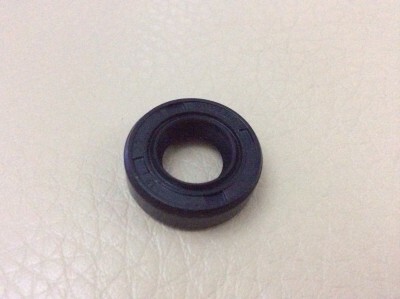 Cam cover outer seal and cam cover screw black seals. Fits all Bonneville range listed here up to VIN 456550. Bonneville, Thruxton, Scrambler, Speedmaster and America. 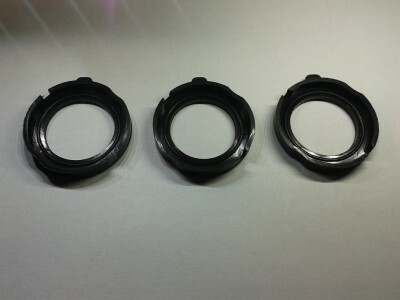 Cam Cover Seal Set 955 and 1050 models. Cam cover seal set to fit all 1050 and later 955 engines. 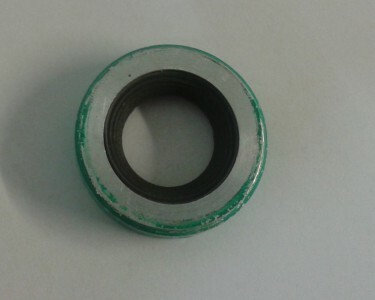 Large outer seal, cam cover screw seals x 6 and spark plug tunnel seals x 3. Fits: 955 ST and 955RS from VIN 139277, Daytona 955 from VIN132513, Speed Triple 955 from VIN141872, 1050 Speed Triple, 1050 Speed Triple S, 1050 Speed Triple R, Speed Triple S, 1050 Tiger, Tiger Sport, 1050 Sprint ST and 1050 Sprint GT. 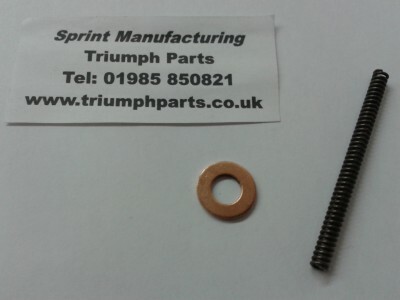 Cam cover seal and cam cover screw seal set to fit all Daytona 675, Street Triple 675 and Tiger 800 models. Also fits: Street Triple S, Street Triple R and Street Triple RS 765 models. Fits all Street Triples from VIN 803572. Cam Cover Ladder Seal (Spark Plug Tunnel) Set later 955 and all 1050 models. Fits: 955 ST and 955RS from VIN 139277, Daytona 955 from VIN132513, Speed Triple 955 from VIN141872, 1050 Speed Triple, 1050 Speed Triple R, 1050 Speed Triple S, 1050 Tiger, Tiger Sport, 1050 Sprint ST and 1050 Sprint GT. Cam cover seal set with x 8 cam cover screw seals to fit T509, Daytona T595, 955 Daytona (up to VIN 132512), Speed Triple 955 (up to VIN 1414871), Sprint ST 955 (up to VIN 139276), Sprint RS (up to VIN 139276), Tiger 900 (injection) and 955 Tiger. 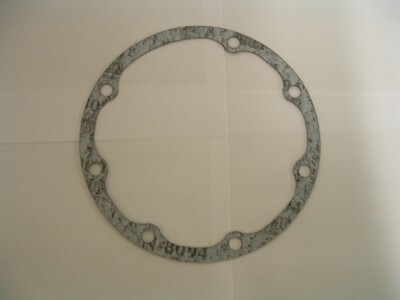 675R Daytona from VIN 564948 lower engine cover gaskets. 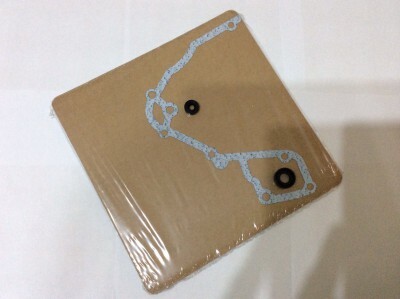 Street Triple S, Street Triple R and Street Triple RS lower engine cover gaskets. Fits all Strret Triples from VIN 803572. 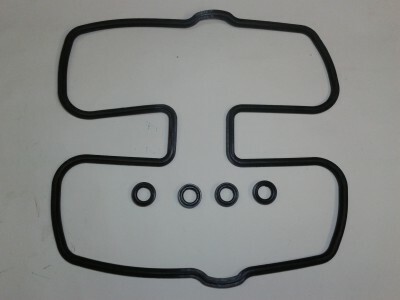 Engine cover gaskets to fit all Tiger 800 models. Fits Tiger 800, 800XCA, 800XCx, 800XR, 800XRT and 800XRx. To Fit: Bonneville Bobber, Bonneville T120, Street Cup, Street Scrambler, Street Twin, Thruxton 1200 and Thruxton R.
Clutch pushrod seal located in the main crankcases under the sprocket cover. With the sprocket cover and pushrod removed the existing seal can be removed/ hooked out and the new seal pushed in. 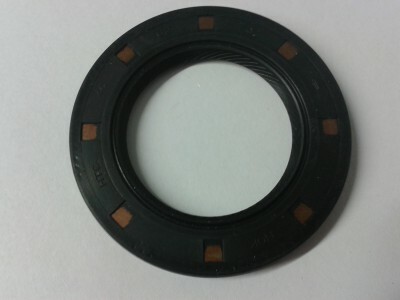 This is the most commonly sold seal as this type of seal prefers rotary motion and not the cross sliding movement of the clutch push rod. When refitting the clutch push rod, it's a good idea to reverse fit the rod, to give a new bearing area for the seal. Fits all hydraulic clutch models. Outer oil seal on the gear change shaft on vitually all Triumph models. The existing seal can be very carefully hooked out and a new seal fitted. On models with a removable cover it's better to remove the cover to do the job. When fitting the seal back onto the splined gear shaft, it's good to cover the spline with tape to protect the seal inner. Fits: TT600, Speed Four, 600/650 Daytona, 750/900 Trident, 900/1200 Trophy, 750/900/1000/1200 Daytona, 750/900 Speed Triple, Sprint 900, Sprint Sport, Sprint Executive, T509, 955/1050 Speed Triple, 955/1050 Sprint ST, 955 Sprint RS, Tiger 900/955/1050, Thunderbird 900, Thunderbird Sport, Adventurer, Legend TT. Fits all the Bonneville range up to VIN 372312, Bonneville, T100, Thruxton, Scrambler, Speedmaster and America. 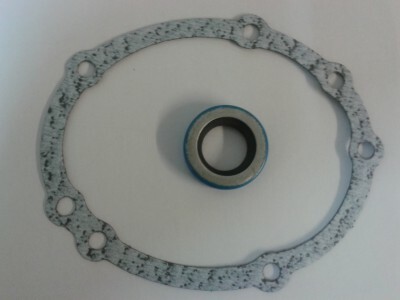 Gearbox output shaft HTC directional oil seal (anticlockwise for all these models - not suitable for the Bonneville engines as they use a clockwise directional seal) fits T509, T595, 955 Daytona, 955 Speed Triple, 1050 Speed Triple, 955 Sprint ST, 955 Sprint RS, 1050 Sprint ST, 750/900 Trident, 750/900 Speed Triple, 750/900/1000/1200 Daytona, 900/1200 Trophy, Tiger 900 (carburettor and injection), 955 Tiger, 1050 Tiger, Thunderbird, Thunderbird Sport, Adventuer, Legend, Trident Sport, Sprint 900, Sprint Sport and Sprint Executive. Green valve stem seals sold individually. 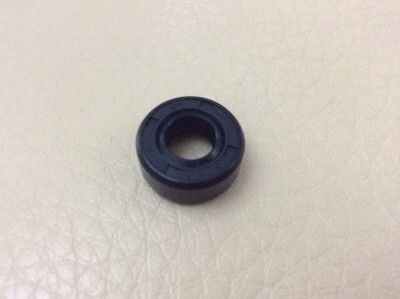 5 mm valve stem size. Fits 955 Sprint ST and RS from VIN 139277, Daytona 955 from VIN 132513, 955 Speed Triple from VIN 141872, 1050 Sprint ST and GT, 1050 Tiger, Tiger Sport, 1050 Speed Triple, 1050 Speed Triple R, Tiger Explorer and XC, Trophy 1215 and SE. Engine cam cover screw seals used on all models (see note on Bonneville air cooled range below). Known as Dowty or bonded seals. This latest version has x 2 lips on the inside of the seal. 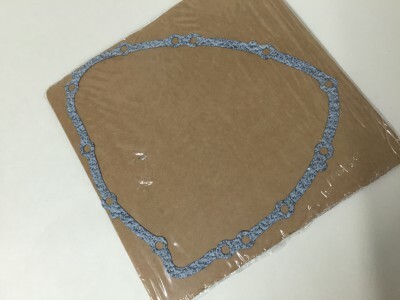 Fits the Bonneville air cooled range before VIN 456550. 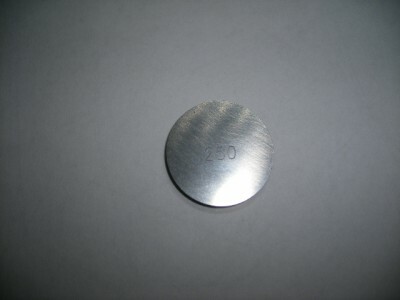 For Bonneville, T100, Thruxton, America and Speedmaster only after VIN 456550 see part number TA865. Replacement cam chain tensioner spring. 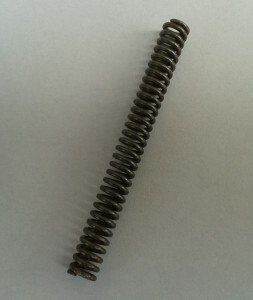 It is recommended that the spring is replaced if its length has reduced significantly below 73.7mm. 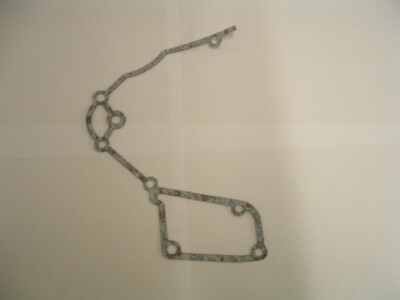 This is a much more cost effective option than replacing the complete tensioner assembly. 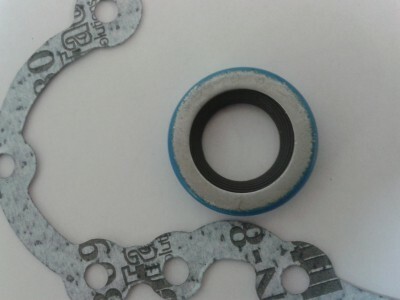 To change the spring, acces by removing the large central bolt. The tensioner does not have to be removed. Removing just the central bolt still allows the ratchet mechanism to retain the existing tension on the cam chain. Fits: Adventurer, America, Bonneville, T100 & SE, Daytona 750, 900, 1000, 1200, Daytona T595, Daytona 955, Rocket III, Classic, Roadster & Touring, Legend, Scrambler, Speedmaster, 750 & 900 Speed Triple, Speed Triple T509, 955 Speed Triple, 1050 Speed Triple, Sprint 900, Sprint Sport, Sprint Executive, Sprint RS & ST 955, 1050 Sprint ST, Thruxton, Thunderbird 900, Thunderbird Sport,Tiger 900 (carburettor), Tiger 900 (injection), Tiger 955i, Tiger 1050, 750 & 900 Trident, Trophy 900 & 1200. 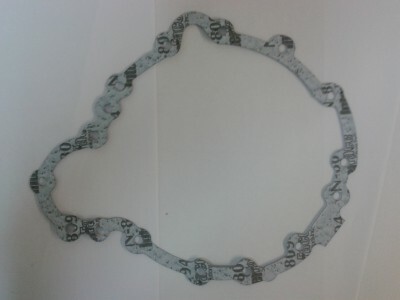 Replacement cam chain tensioner spring to fit TT 600, Speed Four and 600/650 Daytona. 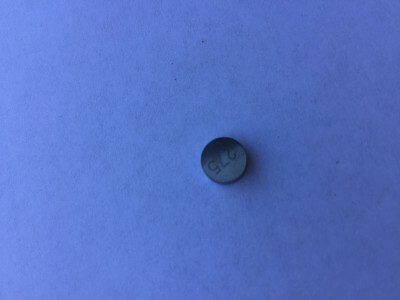 Original spring length when new is 52 mm. 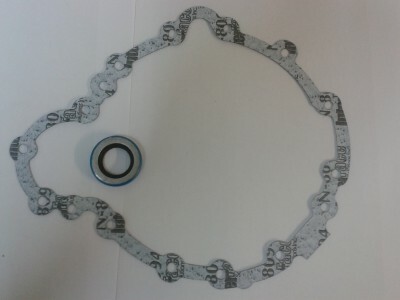 New Replacement Cam Chain Tensioner Spring complete with copper sealing washer for use in all Silver Coloured 675 cam chain tensioner housings. 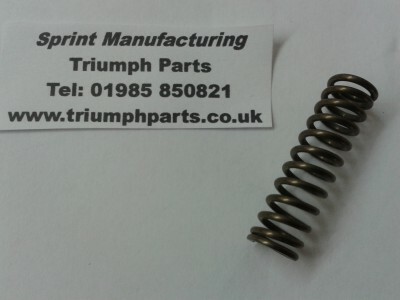 To check how much your cam chain tensioner spring may have compressed, a new Triumph spring measures 60mm in length. Replacement of the spring is a much more cost effective option than replacing the complete tensioner assembly. 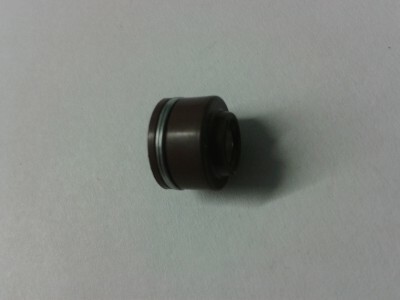 Replacement of the spring requires only the 10mm hexagon headed bolt to be removed and the spring can then be replaced. A very simple job. Also used on the Street Triple R after VIN 493832 apart from VIN 503519 to 508231 which have the silver coloured adjuster fitted. 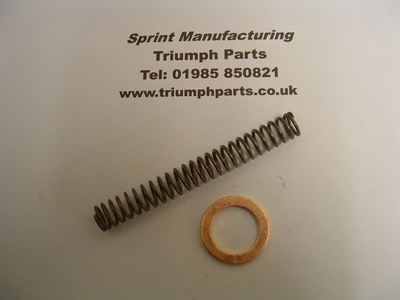 To check how much your cam chain tensioner spring may have compressed, a new Triumph spring measures 35mm in length. Replacement of the spring is a much more cost effective option than replacing the complete tensioner assembly. With this style of tensioner, it has to be removed to fit a new spring. There are x 2 spring clips on these tensioners. The rear spring in the tensioner slot if pulled together will allow the plunger to compress or be completely removed to change the spring.The front clip is used to hold the plunger fully in for reassembly. When the plunger is compressed, the front clip can be pulled together with long nose pliers to locate in the groove near the tip of the plunger.